When: Thursday, May 5 at 7 p.m.
With the goal of launching a new entertainment tradition, students and faculty at UBC Okanagan’s Faculty of Creative and Critical Studies are planning their inaugural film festival. 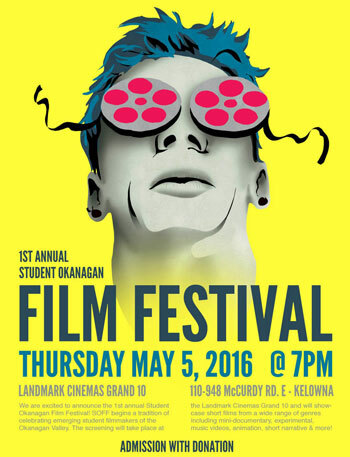 The Student Okanagan Film Festival hopes to celebrate emerging student filmmakers of the Okanagan Valley by showcasing their work. A jury, consisting of various faculty members, selected more than a dozen diverse student short films for the event. Future SOF Festivals will include student films from throughout the valley. The film festival at the Landmark Cinemas Grand 10 will showcase short films from a wide range of genres including mini-documentary, experimental, animation and short narrative. The screening is about 60 minutes. This event is open to the public. Admission is by donation, with additional funding provided by FCCS and the Irving K. Barber School of Arts and Sciences.